Posted October 29, 2012 . One of the most difficult decisions you will have to make now is finding a general dentist. We would like to help you make that decision in keeping with your expectations of high quality dental care. 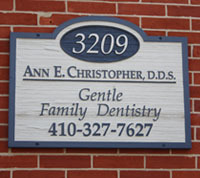 We’re a family-oriented dental practice , offering comprehensive and multi-disciplinary treatment to our patients in the Baltimore & surrounding area. What makes us unique is our very personal quality care. Our first priority is your comfort. Your individual needs are always considered and your choices always respected. Dentistry has dramatically changed over the years. New materials and techniques have given us the means to perform some pretty wonderful transformations. We place crowns, partials, and dentures. Cosmetically, we work real magic with bonding, Lumineers, and Zoom teeth whitening system. These procedures not only repair teeth, but also self-esteem. The best part is seeing a patient who feels good about their dental health and looks good too. If you would like any additional information or would like to set up a free consultation or free digital smile makeover please call and we’ll be happy to assist you.